Hello! I finally had a chance to play in one of the Waltzingmouse sketch challenges! I pulled out one of my WMS stamp sets and paired them together with Cosmo Cricket Togetherness paper. Accessories: Fancy Tags Shapeabilities (Spellbinders), Wrinkled ribbon (May Arts), Bow Easy, Silver nailheads, Foam tape, Thread, Sewing machine. LOVE this Steph! I have to get some of those WM stamps for sure! AWESOME layout and that paper is my new fav! Sweet card, love the paper and color combo. Nicely done. Thanks for playing along with us at Waltzingmouse Stamps! So pretty Stephanie, I love that paper and your stitching! Beautiful card and I love the color combo. What a neat card! Very nice! what a lovely entry for the Waltzingmouse challenge, Steph...that paper really is fun! So pretty Stephanie! That yellow bow is stunning! Thanks so much for playing along with this week's WMSC :) Hope you come back & play again! OMgoodness this is so sweet! Luvin' these papers and of course the stamps are divine!! Thanks for playing with WMS this week! Stephanie, this is just fab! Love the mix of colors the fun patterned paper from Cosmo and the gems and the fun way you tied it all together. (ok, that was a long run on sentence but I did love all of it!) 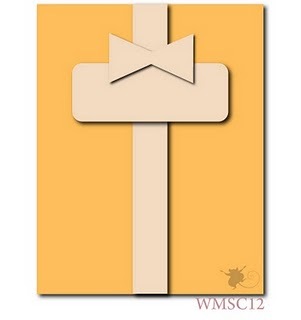 :) Thanks for playing with the WMS sketch this week -- totally awesome card! This looks super Stephanie with that fun bird DP! love the yellow ribbon! So glad you got to play with the WMS sketch this week! This is one of my favorites in the challenge...I love these colors and yet haven't had the courage to use what is in my stash! Thanks for sharing! Gorgeous card! I love that line of paper. I so need to get it now. Perfect bow too. Love that! Congrats on winning, did you know? i am in love with that paper :) but what a lovely way to make our sentiment be your wonderful focal point. tasteful bling and a lovely sweet ribbon to dress it up. congrats on your top mouse award!